Guys, I have decades of freshwater angling experience but not a lot when it comes to sea fishing. Years of match fishing (pre Carp yuck), specimen hunting for Chub and Barbel then onto split cane stuff. I have been out on the odd boat trip but never done any beach casting. Im after a lot of advice about beach fishing, both tackle and skills. Im going back to Spain in September and would love to do some beach fishing. I would love to have some sort of guidance for beach casting rods and would rather use a muliplier (although I get the feeling they are old fashioned?). What length rod, which multiplier, terminal tackle etc please? I know it's a can of worms but I have no experience since my fibreglass boat rod days! Oh and I will be fishing in the Nerja, Torrox region of southern Spain. I know there are a couple of tackle shops down there but the rods looked very basic and expensive so thinking of taking one out there in a tube to leave at my friends villa. You need a decent carbon fibre beach caster 12-14 ft long rated to cast up to 200 gms. The cheapest one I know which is any good is the Penn Rampage II which can be had for £90-110. Do not get any of the so called "composite" rods which can be had for £20-40, they are are rubbish, a waste of money and are aimed at schoolboys who know no better. Personally I use 14ft Abu Garcia which cost me around £130. 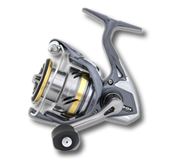 I do not use multipliers for beach work they are too much hassle for me instead I use Daiwa fixed spool jobs designed for beach work and hold at least 200 metres of 20lb line. Yes I know that a lot of guys use 15lb line but I want a line that will stand up to being dgragged across shingle so I always use 20lb and make sure it is a bright colour such as yellow then you won't get seagulls flying into it and causing mayhem. I cast with 4 oz or 6 oz sinkers which are spiked so that they stay put rather than wandering about in the current. Hooks are all about what fish you expect so I use 2's or 4's for small mouth species such flatties and bream and 1/0 and 2/0 for the big gob fish such as bass. If you are expecting something like a 20lb cod then go up more to 3/0 or 4/0. Whether you use braid or mono line is a personal choice. Being an old fart I still use mono off the beach but my skipper insists I use braid on my multiplier when wreck fishing. Hope that helps.